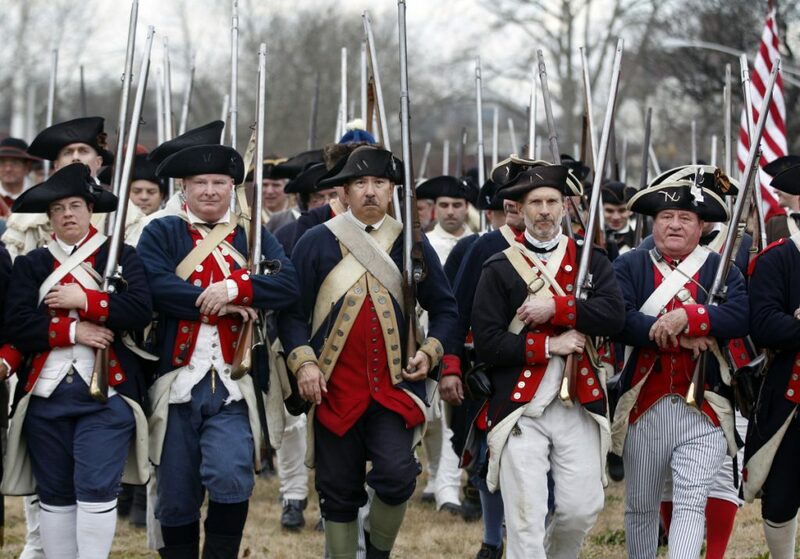 Revolutionary War re-enactors stage the Battle of Trenton on Dec. 31, 2011, in Trenton, N.J. The battle took place on Dec. 26, 1776; nearly the entire Hessian force was captured, changing the narrative of the war. We know how it ends now, so victory seems inevitable. But to the people fighting for independence in late 1776, it was anything but a sure thing. In fact, when the British suspended their campaign for the winter on Dec. 13, making camp in Trenton, New Jersey, the future of the Continental Army looked downright grim. The Americans had surrendered Fort Washington on Nov. 16, then retreated from Fort Lee a few days later, the end of a disastrous attempt to control New York. The Army – battered and depleted from combat, disease and the cold – was left without baggage, tents and tools for the winter ahead. What started as a force of 20,000 in August was down to about 3,500 men, most of whom were at the end of their enlistments. Gen. George Washington was preparing for the real possibility that the British would overrun Philadelphia – the revolutionaries could take to the Allegheny Mountains, he supposed, and fight a guerrilla war if necessary. The one hope for the Americans came in the form of reinforcements who were on their way. Yet when the soldiers arrived, it was a much smaller force than promised. As historian David McCullough writes in “1776,” the Americans were hungry, ill, dirty and dispirited. Soldiers and citizens alike were leaving the cause. Of course, Washington and his troops would cross the Delaware River on Christmas night, and surprise Hessian soldiers fighting for the British. Two more victories would follow, on Jan. 2 and 3, that would boost the morale of the Americans and change the narrative of the war. One lesson of this time is the strength of conviction. Washington believed in the cause he was fighting for, as did the top-level officers around him, as did the rank-and-file soldiers who fought with courage against a more organized and powerful foe. Those convictions didn’t change just because things got harder. The dedication to the cause didn’t waver just because the outlook dimmed. The ideals of the revolution were worth fighting for regardless of the outcome or consequences. A second lesson is that history is not fate – it looks that way only in hindsight. The United States did not survive 1776 because it was our destiny; it survived because Washington was a leader of profound perseverance. It survived because of the soldiers who endured the brutal aftermath of the losses in New York and still answered the call to cross the Delaware. To us, they are the Continental Army that eventually would make history. But on those days in late December 1776, they were makeshift soldiers with an uncertain future, and with no assurances that high-minded ideals and principles would win out. So they just decided to fight the next day, and the day after that. They met the dark with words and actions they believed in, even though there was no guarantee of triumph.